People fear what they don't understand: Change, Death, 4th grade math word problems. . . I am still waiting for the day I'll use MATHEMATICS integration in real Life. Relationships are a lot more like algebra. For instance. Have you ever loked at your X and wonderd Y?. When you realize that all you learned in Algebra 2 will not matter to you in your future life. Life is like mathematics, to work out your life, you need formulas that suit your uniqueness. In math two negatives multiplied together make a positive, in life two wrongs don't make it right! 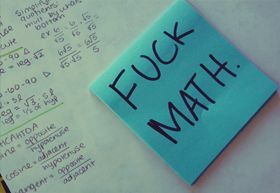 Relationships were meant only for two people; unfortunately for some of us, math is not our favorite subject. An important aspect of being a scientist isn't just knowing the math, but also knowing of imagination. Joy goes against the foundations of mathematics: it multiplies when we divide. Mathematics, also known as arithmetic mainly involves calculations and the four basic operations used are addition, subtraction, multiplication and addition. While mathematics is a passion and obsession for some, it appears as a nightmare for others. Probably, Carl Sandburg felt very much when he said, “arithmetic is where numbers fly like pigeons in and out of your head ‘. But in the land of India, where zero was first invented, there were mathematics genius like Srinivas Ramanujan, whose findings and theories on mathematics are still a puzzle for experts to comprehend.